Thanks for checking out Little Bee Font! 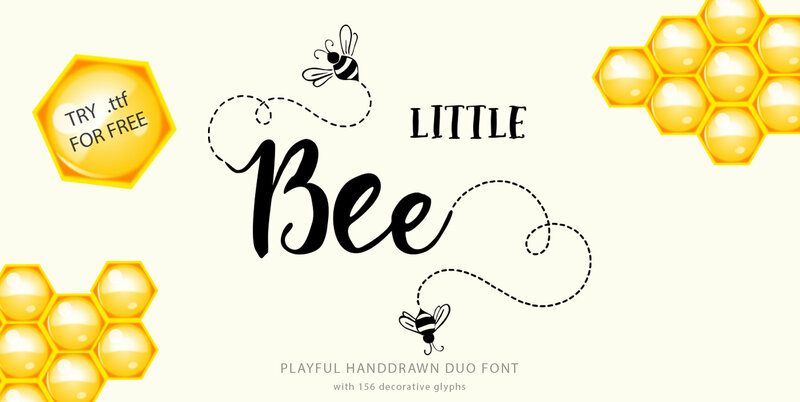 Little Bee is a beautiful script font with an unique bouncy character. 3 variants of letters for the uppercase and 7 variants of letters for the lowercase, make this font an unique tool for creating handdrawn texts, which are written with a brush and ink. You can see contextual alternates and playful decorative alternates with hearts, flying little bees and flowers. With this font your messages will become really super cute. This font is perfect for posters, greeting cards, t-shits, branding materials, quotes and any other amazing projects you are working on. just type the number after any letter ( 1…2 for uppercase, 1…6 for lowercase). So, you can forget about the Glyphs panel and have fun and great results just type numbers after letters. You can still use the Glyphs panel. You’ll see there 208 contextual and stylistic alternate glyphs and 17 double letters ligatures. Little Bee come with PUA Unicode that gives you full access to the ligatures and alternates in software that doesn't support the extra characters. To access these characters you can use Font Book (Mac) or Character Map (Windows). Fonts include multilingual support: Western European, Central European and South Eastern European languages. Please type characters in text box below to check any characters you need.